Common Nighthawks are one of the nesting birds in the headwaters of the Everglades. After wintering in South America, Common Nighthawks spend their spring and summer breeding and raising young thoughout North America. At sunset they can be seen flying above the Florida scrub habitat. They are well known for their territorial display, which includes a steep dive accompanied by a booming sound. Researcher Elly Knight watches Common Knighthawks at Archbold Biological Station. Common Nighthawks are not protected as endangered species in the USA, but they are federally threatened in Canada due to steep population declines. Elly Knight is a PhD student at the University of Alberta, where she makes audio recordings of the birds in the wild to learn more about their territorial behavior. The migration routes of Common Nighthawks are poorly understood, so she came to Florida to put satellite trackers on them as part of a collaborative project between the Smithsonian Migratory Bird Center and many other organizations. During the summer of 2017, 63 tags were deployed throughout 9 breeding locations in North America. Researcher Elly Knight and her field site collaborators set out multiple mist nets in areas with Common Nighthawks flying nearby. 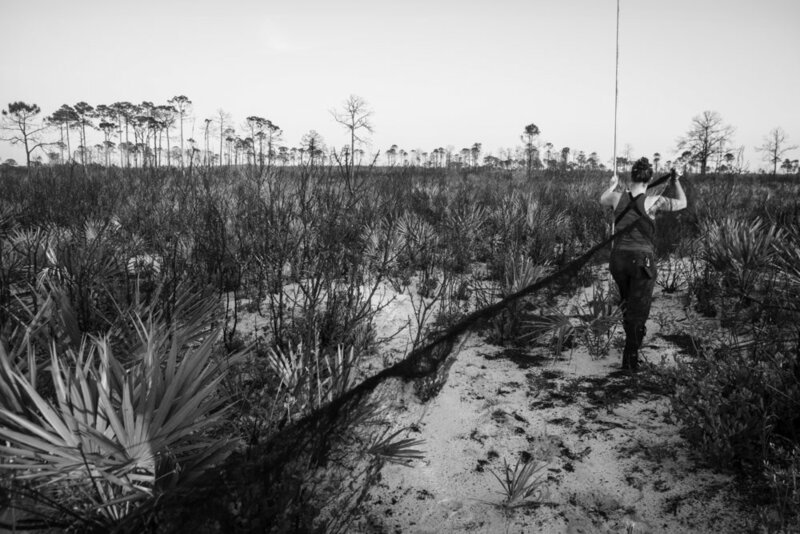 Researcher Greg Thompson puts a handmade decoy in the net to draw in one of the nearby Common Nighthawks. The team will also play audio recordings of Common Nighthawk sounds to attract the birds. Common Nighthawks lay their eggs on bare sand. Although we saw quite a few Common Nighthhawks on the evening I helped out, the researchers were unsuccessful in catching any that night. The birds flew close to the nets, but were able to maneuver out of the way before getting caught.